This Scott’s Selection Linlithgow was also split with European hand model and retired tightrope walker, Florin. Unlike the 1982-2003, bought at the same time, this one does not say St. Magdalene on the label and is also not a total cipher. It has a Malt Maniacs score and Serge seems to have reviewed it and not liked it very much. 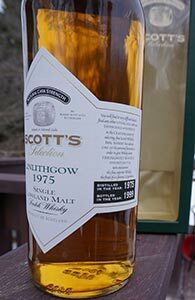 Or at least he reviewed a Linlithgow 1975-1999 from Scott’s of the same abv. Odds seem poor that there were two separate releases from the same year with the same abv but I’ve also not seen references to other Scott’s bottles split for the European and American markets (Serge refers to an EU airport purchase). He didn’t like his very much (79 points), but the usually far more parsimonious Johannes gave that bottle 83 points on the Malt Maniacs’ Monitor; and 83 points from Johannes is usually like high 80s from anyone else. Linlithgow is the other name under which the malt from the (now defunct) St. Magdalene distillery in the Lowlands was bottled. I believe Linlithgow is the name of the village in which the distillery was located. As to whether there was some key to when one name or the other was used, I don’t know. 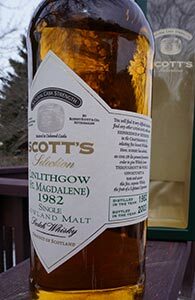 At any rate, this bottle from Scott’s Selection says Linlithgow and St. Magdaelene (in parentheses) as you can see alongside. There is no information out there on this bottle (that I could find at any rate). After staring at it for a couple of years I decided to take a flyer on it and as luck would have it, a friend was willing to split it. As you will see, I did not rue this decision.